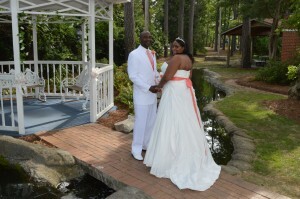 Sharrica Earle of Detroit, Michigan and James Mason Bunch of Vance, South Carolina were united in marriage on May 11, 2013 at Wedding Chapel by the Sea in Myrtle Beach, South Carolina. Dr. Terrence Grainger officiated. The bride is the daughter of Anthony and Carol Earle. She is the granddaughter of Doris V inson, Luther Mullins, Stanley Earle, and Rosa Lee Earle. The groom is the son of Barbara Felder and Larry Bunch, Sr. The bride is employed at Cal Inventory Service. The groom is employed at Chuck E. Cheese/Harbor Freight Tools. After a honeymoon in Myrtle Beach, South Carolina, the couple will reside in Columbia, South Carolina.